ANNVILLE (PA) – The Delaware Valley College senior tandem of quarterback Aaron Wilmer and wide receiver Rasheed Bailey put together another sterling performance as the two teamed up for four touchdown passes while Wilmer ran for another two in the Aggies’ 59-41 shootout win at defending Middle Atlantic Conference (MAC) champion Lebanon Valley College. The win improved Delaware Valley to 3-0 overall and 2-0 in the conference as it defeated the Flying Dutchmen for the 11th time in their last 12 meetings. Lebanon Valley remained winless at 0-4 and 0-3. The two teams combined for 100 points, 150 offensive plays and 1,049 yards in the contest. For the Aggies, it upped their average of points per game to 47.7 and the offensive unit made marks in the record books once again. In week one against Montclair State, Wilmer threw for 394 yards (second-highest, single-game total in school) while Bailey tied a mark with 11 catches for 216 yards (fifth-highest). Last week’s 54-35 win over Wilkes saw senior tailback Chris Smallwood rush for 213 yards (fifth-highest) and a record six touchdowns. This week, Bailey tied a 46-year-old school record with his four touchdown catches. He finished with six receptions for 186 yards and the 10th-highest, single-game receiving yardage total. Bailey also became just the 11th player in program history to reach the 100-catch mark for a career (104). And then there was Wilmer as the three-time all-conference quarterback completed 20 of 31 passes for 383 yards and four scores while also rushing for 63 yards and two trips to the end zone. The yardage total was the fourth-highest on a single afternoon and he is the first Aggie to throw for 380 or more yards twice in a career, let alone a season. The two teamed up for a score just 2:26 in as a big kickoff return by Armani Fuller-Williams and a Lebanon Valley person foul penalty on a third-down stop put the Aggies in scoring position. Wilmer then hit Bailey underneath for catch number 100 and Bailey went the final 12 yards, including a dive into the end zone for a 23-yard touchdown. Brandon Snyder added the extra-point and Delaware Valley had the early 7-0 lead. Lebanon Valley moved into Aggie territory, but then a backwards pass hit the ground for a fumble and linebacker Matt Smith recovered it to give Delaware Valley the ball at its own 49. The Aggies then faced a fourth-and-two from the Flying Dutchmen 25 when Wilmer found Danny Lopez for a 21-yard reception and a first-and-goal from the four. Wilmer then called his own number and found the end zone. Snyder hit the point-after for a 14-0 lead with 6:10 left in the quarter. The Aggies got a stop on ensuing possession, but a roughing the passer call on third down allowed Lebanon Valley to hold onto the ball. Two plays later, quarterback Brian Murphy found a wide-open Darryl Sweeper behind the secondary for 66-yard touchdown. The extra-point kick failed, leaving the score at 14-6 with 4:01on the clock in the first quarter. Delaware Valley came right back and put together a 10-play, 59-yard drive that was capped by Smallwood’s one-yard leap over the pile and into the end zone on the first play of the second quarter for a 21-6 advantage. But, Lebanon Valley countered with a long drive of its own, an 11-play, 77-yard possession that ended with Brendon Irving’s one-yard scoring run and a 21-13 contest with 9:40 left before the intermission. The Aggies returned the kickoff to their own 30 and just needed 10 seconds to strike as, on play action, Wilmer hit Bailey in stride for a 70-yard touchdown. Snyder’s boot made it a 28-13 advantage for Delaware Valley. The shootout continued as Murphy and Sweeper teamed up again, this time for a 41-yard bomb to make it 28-20 with 6:35 still on the clock. Another big return by Fuller-Williams gave the Aggies excellent field position at their own 45-yard line. Delaware Valley stalled at midfield and was forced to punt. A low snap went back to Snyder and his knee touched the ground, giving the Flying Dutchmen the ball at the Aggie 36. Three plays later, Murphy hit Tyler George for a touchdown to pull Lebanon Valley to within one, 28-27 with4:24 remaining in the half. Delaware Valley converted a big fourth down play on the ensuing possession as Wilmer hit Mike Jensen. On the next play, Wilmer hit Bailey as Bailey got popped, but he held on for the 26-yard touchdown. Snyder hit his fifth extra-point of the game to up the lead to 35-27 just two minutes after Lebanon Valley’s score. The Aggie then recovered a fumble on the next drive of the game as Smith pounced on a loose ball in Flying Dutchmen territory. Three plays later, Wilmer scored again, this time from eight yards out and a 42-27 advantage with just 58 seconds left in a wild opening half of play. Delaware Valley’s defense got a stop on the first possession of the second half. The Aggie offense took over on their own 34 and, six plays later, they faced a third-and-15 from the Lebanon Valley 36. Wilmer then threaded the needle with a perfect pass to Bailey in the end zone for their fourth scoring connection of the day. Snyder hit another extra-point to up the lead to 49-27 nearly six minutes into the half. A Flying Dutchmen touchdown run by Bill Powanda brought them to within 15, 49-34, with 4:36 left in the third quarter. A Wilmer pass was intercepted and Lebanon Valley converted it into seven points as a nine-play, 60-yard drive was capped by Irving’s 10-yard touchdown run. The score made it 49-41 just six seconds into the fourth quarter. Delaware Valley was stopped on the ensuing possession and a Snyder punt rolled to the Flying Dutchmen seven-yard line. They stalled on the drive at their own 18 and, following a punt, the Aggies took over at their own 39-yard drive. A 16-yard catch by Lopez and a 26-yard run by Tyler Bing put the ball inside the red zone. Bailey made a diving grab in the end zone but it was called back due to a holding penalty. Later in the drive, Snyder came on for a 38-yard field goal try and nailed it with room to spare to up the lead to 52-41 with 8:31remaining. Lebanon Valley moved the ball down to the Delaware Valley 30 where it faced a fourth-and-two. Murphy’s pass sailed incomplete. On the ensuing possession, Smallwood burst free for a 40-yard touchdown run and a 59-41 lead with less than five minutes to go. The Aggies got the ball back and ran the clock out to remain undefeated. 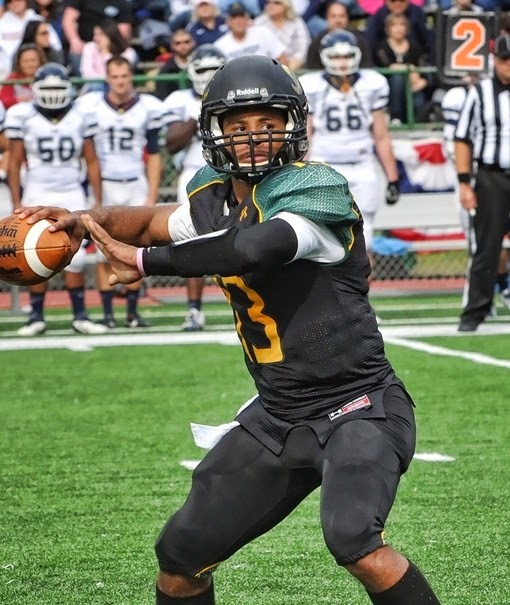 Delaware Valley finished with 584 total yards (383 passing, 201 rushing). In addition to Bailey and Wilmer’s numbers, Smallwood finished 87 yards and two touchdowns on 16 carries. Fuller-Williams netted 139 yards on six kickoff returns. Defensively, Danny Wynne had 14 tackles while Smith notched 10 stops, two fumble recoveries and one sack. For Lebanon Valley, Murphy was 19-for-32 for 264 yards and three touchdowns. Sweeper caught six passes for 150 yards and two scores while Irving ran for 153 yards and one touchdown on 28 carries.